Want to spend your time in Pattaya among celebrities, royalty, and some of the world’s most famous people? Head on over to Louis Tussaud’s Wax Works at the Royal Garden Mall and you will soon be hanging out with the likeness of famous people like Johnny Depp, the Dali Lama, Prince William, and many more. Located on the top floor of the Royal Garden Mall in Pattaya, Louis Tussaud’s Wax Works is part of series of Ripley’s Entertainment attractions that occupy most of the floor. 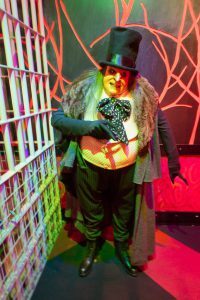 Here you’ll find other amusements such as Ripley’s Believe It Or Not, The Infiniti Maze, and Ripley’s Haunted Adventure. With a lead in like that you might be wondering how bad the wax figures are in the Louis Tussaud’s Wax Museum in Pattaya. In all fairness, a lot of them are pretty bad. While they are all identifiable, mostly it’s because of their outfits or their surroundings. The best replicas are the Superheroes and Villains, it is apparently easier to recreate than human faces. How bad are they? You can take a sneak peek at a few images below. But the bad recreations are really what makes taking this tour fun. Seeing how ridiculously bad some of the models will surely put a smile on your face. While Louis Tussaud’s won’t make it on the list of the top 10 attractions in Pattaya, it’s a fun way to spend some time on a rainy day and worth combining with Ripley’s Believe It Or Not for a couple hours of amusement.